ab156302 will detect alpha and gamma specific actin from skeletal, cardiac and smooth muscle. Synthetic peptide within Human muscle Actin aa 350 to the C-terminus. The exact sequence is proprietary. WB: HeLa, A431, A673, HEK293, MCF7, L6 and NIH 3T3 cell lysates, human fetal artery, kidney and heart tissue lysates, human uterus, stomach and skeletal muscle tissue lysates and rat spleen tissue lysates. IHC-P: Human skeletal muscle, smooth muscle in colon, cervical carcinoma and heart muscle tissues. Mouse cardiac muscle and rat colon tissues. ICC/IF: HeLa, A673 and NIH3T3 cells. Flow Cyt: HeLa cells. IP: NIH 3T3 cell lysates. Our Abpromise guarantee covers the use of ab156302 in the following tested applications. WB 1/1000 - 1/10000. Predicted molecular weight: 42 kDa. Overlay histogram showing HeLa cells fixed in 4% PFA and stained with purified ab156302 at a dilution of 1 in 50 (red line). The secondary antibody used was FITC goat anti-rabbit at a dilution of 1 in 500. Rabbit monoclonal IgG was used as an isotype control (black line) and cells incubated in the absence of both primary and secondary antibody were used as a negative control (blue line). Immunohistochemistry (Formalin/PFA-fixed paraffin-embedded sections) analysis of rat colon tissue labelling muscle Actin with purified ab156302 at a dilution of 1/250. Heat mediated antigen retrieval was performed using Tris/EDTA buffer pH 9. ab97051, a HRP-conjugated goat anti-rabbit IgG (H+L) was used as the secondary antibody (1/500). Negative control using PBS instead of primary antibody. Counterstained with hematoxylin. Immunohistochemistry (Formalin/PFA-fixed paraffin-embedded sections) analysis of mouse cardiac muscle tissue labelling muscle Actin with purified ab156302 at a dilution of 1/250. Heat mediated antigen retrieval was performed using Tris/EDTA buffer pH 9. ab97051, a HRP-conjugated goat anti-rabbit IgG (H+L) was used as the secondary antibody (1/500). Negative control using PBS instead of primary antibody. Counterstained with hematoxylin. Immunohistochemistry (Formalin/PFA-fixed paraffin-embedded sections) analysis of human cervical carcinoma tissue labelling muscle Actin with purified ab156302 at a dilution of 1/250. Heat mediated antigen retrieval was performed using Tris/EDTA buffer pH 9. ab97051, a HRP-conjugated goat anti-rabbit IgG (H+L) was used as the secondary antibody (1/500). Negative control using PBS instead of primary antibody. Counterstained with hematoxylin. Immunocytochemistry/Immunofluorescence analysis of A673 cells labelling muscle Actin with purified ab156302 at 1/100. Cells were fixed with 100% methanol and permeabilized with 0.1% Triton X-100. ab150077, an Alexa Fluor® 488-conjugated goat anti-rabbit IgG (1/1000) was used as the secondary antibody. DAPI (blue) was used as the nuclear counterstain. ab7291, a mouse anti-tubulin (1/1000) and ab150120, an Alexa Fluor® 594-conjugated goat anti-mouse IgG (1/1000) were also used. Flow Cytometry analysis of HeLa cells labelling muscle Actin with purified ab156302 at 1/50 (red). Cells were fixed with 4% paraformaldehyde. An Alexa Fluor® 488-conjugated goat anti-rabbit IgG (1/500) was used as the secondary antibody. Black - Isotype control, rabbit monoclonal IgG. Blue - Unlabelled control, cells without incubation with primary and secondary antibodies. ab156302 (purified) at 1/20 immunoprecipitating muscle Actin in NIH/3T3 whole cell lysate. Lane 2 (+): ab156302 + NIH/3T3 whole cell lysate. Lane 3 (-): Rabbit monoclonal IgG (ab172730) instead of ab156302 in NIH/3T3 whole cell lysate. This blot was produced using a 4-12% Bis-tris gel under the MOPS buffer system. The gel was run at 200V for 50 minutes before being transferred onto a Nitrocellulose membrane at 30V for 70 minutes. The membrane was then blocked for an hour using Licor blocking buffer before being incubated with ab156302 overnight at 4°C. Antibody binding was detected using ab175781 at a 1/10,000 dilution for 1hr at room temperature and then imaged using the Licor Odyssey CLx. Secondary antibody - goat anti-rabbit Alexa Fluor® 790 (ab175781). IHC image of unpurified ab156302 staining muscle Actin in human colon* formalin fixed paraffin embedded tissue sections, performed on a Leica Bond. The section was pre-treated using heat mediated antigen retrieval with sodium citrate buffer (pH6, epitope retrieval solution 1) for 20 mins. The section was then incubated with unpurified ab156302, 5μg/ml working concentration, for 15 mins at room temperature and detected using an HRP conjugated compact polymer system. DAB was used as the chromogen. The section was then counterstained with haematoxylin and mounted with DPX. No primary antibody was used in the secondary only control (shown on the inset). Immunohistochemistry (Formalin/PFA-fixed paraffin-embedded sections) analysis of human skeletal muscle tissue labelling muscle Actin with unpurified ab156302 at a dilution of 1/1000. Immunohistochemistry (Formalin/PFA-fixed paraffin-embedded sections) analysis of human heart muscle tissue labelling muscle Actin with unpurified ab156302 at a dilution of 1/1000. Unpurified ab156302 staining Actin in HeLa cells. The cells were fixed with 100% methanol (5min) and then blocked in 1% BSA/10% normal goat serum/0.3M glycine in 0.1% PBS-Tween for 1h. The cells were then incubated with unpurified ab156302 at 10μg/ml and ab7291 at 1µg/ml overnight at +4°C, followed by a further incubation at room temperature for 1h with an goat anti-rabbit Alexa Fluor® 488 secondary (ab150081) at 2 μg/ml (shown in green) and goat anti-mouse Alexa Fluor® 594 secondary (ab150120) at 2 μg/ml (shown in pseudo color red). Nuclear DNA was labelled in blue with DAPI. 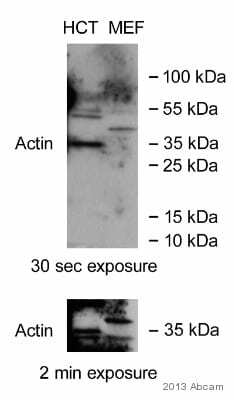 Negative controls: 1 – Rabbit primary and anti-mouse secondary antibody; 2 – Mouse primary antibody and anti-rabbit secondary antibody. Controls 1 and 2 indicate that there is no unspecific reaction between primary and secondary antibodies used. Unpurified ab156302 staining Actin in NIH3T3 cells. The cells were fixed with 100% methanol (5min), permeabilized with 0.1% Triton X-100 for 5 minutes and then blocked in 1% BSA/10% normal goat serum/0.3M glycine in 0.1% PBS-Tween for 1h. The cells were then incubated with unpurified ab156302 at 5μg/ml and ab195889 at 1/250 dilution (shown in pseudo color red) overnight at +4°C, followed by a further incubation at room temperature for 1h with an goat anti-rabbit Alexa Fluor® 488 secondary (ab150081) at 2 μg/ml (shown in green). Nuclear DNA was labelled in blue with DAPI. Overlay histogram showing HeLa cells stained with unpurified ab156302 (red line). The cells were fixed with 80% methanol (5 min) and then permeabilized with 0.1% PBS-Triton X-100 for 20 min. The cells were then incubated in 1x PBS / 10% normal goat serum / 0.3M glycine to block non-specific protein-protein interactions followed by the antibody (unpurified ab156302, 1/100 dilution) for 30 min at 22°C. The secondary antibody used was goat anti-rabbit Alexa Fluor® 488 (IgG H&L) (ab150077) at 1/2000 dilution for 30 min at 22°C. Isotype control antibody (black line) was rabbit IgG (monoclonal) (1μg/1x106 cells) used under the same conditions. Unlabelled sample (blue line) was also used as a control. Acquisition of >5,000 events were collected using a 20mW Argon ion laser (488nm) and 525/30 bandpass filter. Publishing research using ab156302? Please let us know so that we can cite the reference in this datasheet.